*This recipe was updated with new pictures which can be seen in this post. 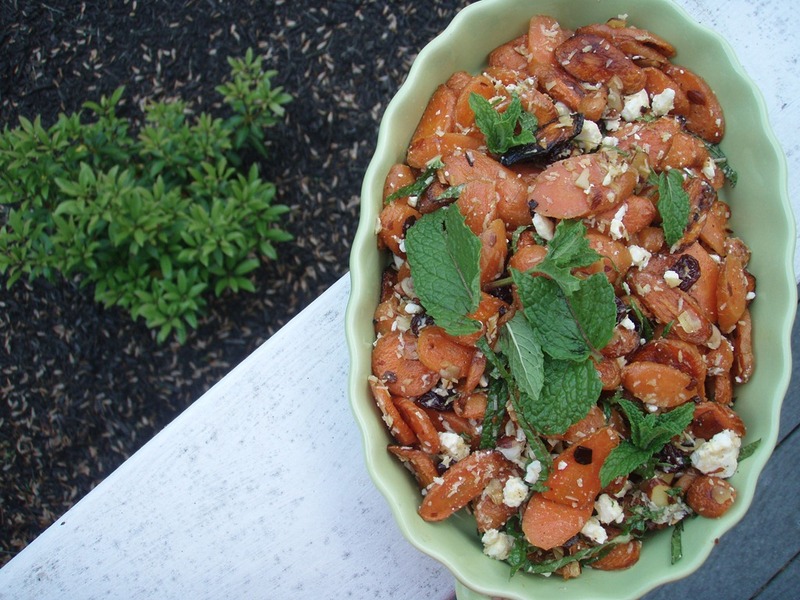 This roasted carrot salad with coconut, almonds, dried cherries and mint is anything but your normal side salad. I’ve been on a bit of a coconut streak lately, adding unsweetened shredded coconut to my oats in the morning, roasting every possible vegetable in coconut oil instead of my usual olive oil, adding coconut butter to smoothies and the list goes on. 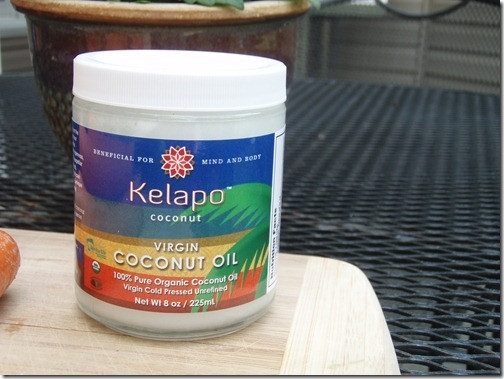 So when Kelapo sent me a little jar of their coconut oil to try out I had no problem thinking of something to use it for. Since it’s Memorial Day weekend and pretty much everyone will be attending a BBQ at some point, I figured I’d make something that would be a nice side to all the grilled food. I hate when BBQ’s consist solely of meat, buns, and chips so I went with a vegetable but dressed it up a bit. It was slightly warm in the house with the oven on in the 85 degree temps this afternoon but I’d say the outcome was worth it. You’ll need about 2lbs of carrots for this. I only had about 1.5lbs of whole carrots so I stole a few baby ones from my hummus dip stash. Wash and trim them. I hardly ever peel my carrots, just give them a good wash. You can peel them though if the outer layer ugliness bothers you. Since these were going to be roasted I figured no one would see the outer layer anyway. Slice the carrots on a diagonal in thin strips and place in a large bowl. Mince up a couple gloves of garlic next and grab about 1/4 cup of sliced almonds. 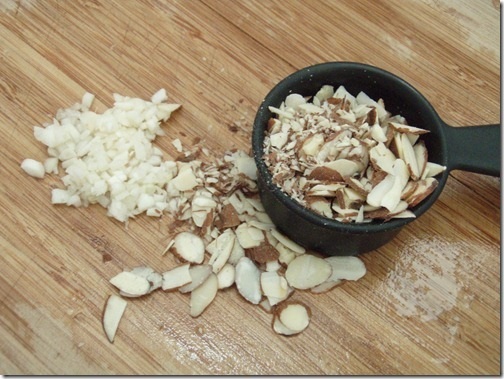 Put both the minced garlic and the almonds into the bowl with the carrots. Coconut oil wants to be solid. It will get slightly melted in the summertime but it’s never quite like other oils that are pourable (unless maybe your house isn’t air conditioned and gets pretty hot). For this recipe you need the oil to be completely liquid so you can pour it into the bowl with the carrots, garlic and almonds and stir to coat everything. I popped about 2 tablespoons into a small bowl and microwaved it for about 25 seconds, that’s all it needed to completely liquefy. 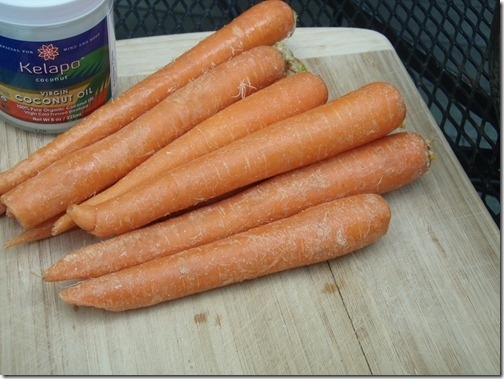 When you pour the now warm/hot oil over the colder carrots the oil might congeal a little. Don’t worry, once it goes into the oven everything will melt again. Pour the carrot mixture onto a baking sheet, you don’t really need to grease it since the oil is coating the mixture already. Roast at 400 degrees for about 30 minutes, mixing/flipping once or twice as they cook. Use the 30 minutes the carrots are roasting to gather up the rest of the ingredients. I contemplated some more nuts/seeds but in the end left it simple with the almonds that were already in it. Not much prep work here. I just did a quick chiffonade with the mint and that was it. Once the carrots are done take them out of the oven and let them rest a bit to cool down. Since we’re adding feta to the mixture you don’t want the hot carrots to melt the cheese. 15 minutes was about as much patience as I had. Pour the carrot mixture back into the bowl and add all the other ingredients to it. Add some salt and pepper to taste and garnish with some mint leaves. I kept this at room temperature to serve because I didn’t want the oil to start to congeal from the cold fridge. Obviously, the leftovers are now in the fridge but I will probably warm them up in the microwave quickly before serving again. The carrots did a great job absorbing the coconut oil flavor. It really stood out in the dish. I think the addition of the shredded coconut helped bring out the coconut oil flavor too. If you’re not a fan of mint I’d go with basil. I was torn between the two but I’m glad I chose the mint, I like the contrast of it with the honey and sweet cherries in this. 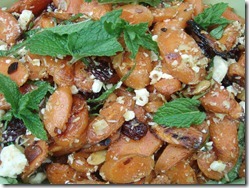 A roasted carrot salad with coconut, almonds, dried cherries and plenty of mint. 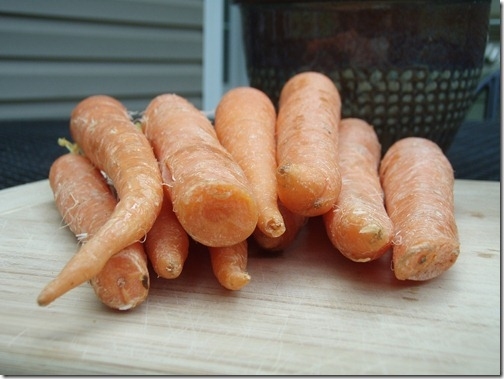 Wash, trim and peel carrots (if not using organic) and slice them diagonally into coins. Add garlic, almonds and carrots to a large bowl. Melt coconut oil and pour over carrot mixture. Add salt and pepper to taste and toss to combine. Spread carrot mixture onto a baking sheet and bake for about 20 minutes, flipping/stirring a few times during roasting. 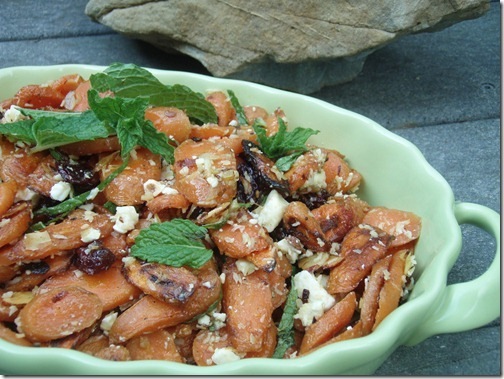 While carrots are roasting, whisk together the olive oil, honey and apple cider vinegar in a small bowl. Set aside. Once carrots are finished roasting, remove from oven and let cool for about 10-15 minutes on the baking sheet. 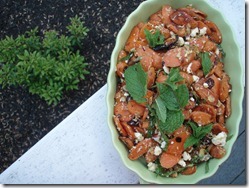 Once cool, add carrot mixture to a large bowl with the feta (if using) and dried cherries. Pour the dressing into the bowl and toss to combine. Garnish with the mint leaves before serving. What are you bringing to your Memorial Day BBQ? have you ever thought about transferring to the CT office? I would really like to eat your leftovers. Is that weird? 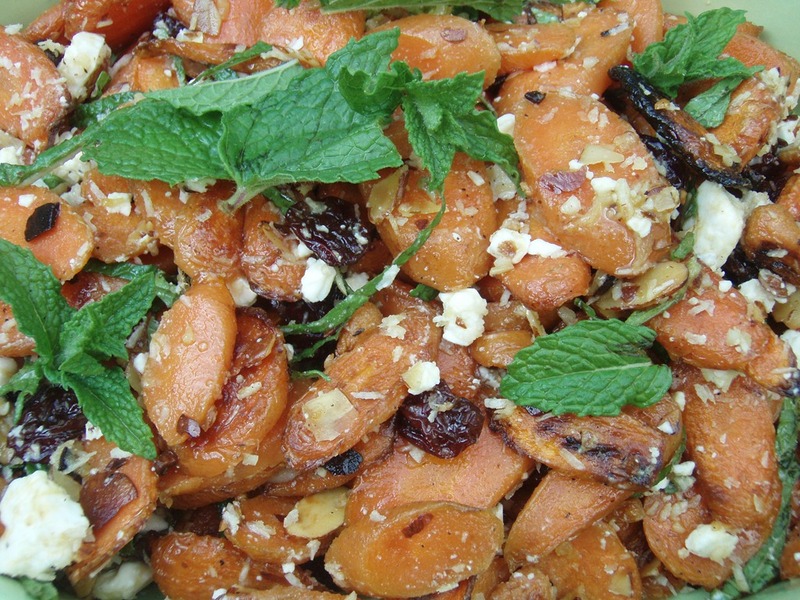 Carrots, coconut, and almonds sounds like an amazing combination! Hmmm… maybe I’ll try that today!! 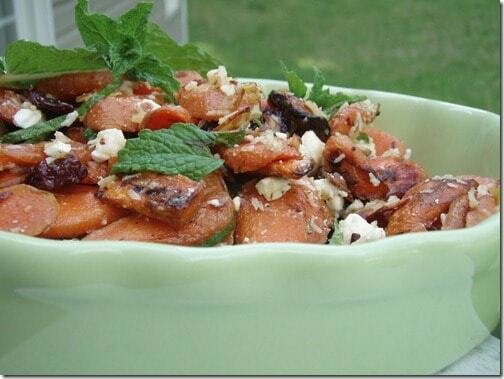 I LOVE CARROTS.. and this recipe looks absolutely delicious. Thanks SO much for sharing it! Oh what a fun salad -this looks GREAT! This combination sounds amazing, great idea! 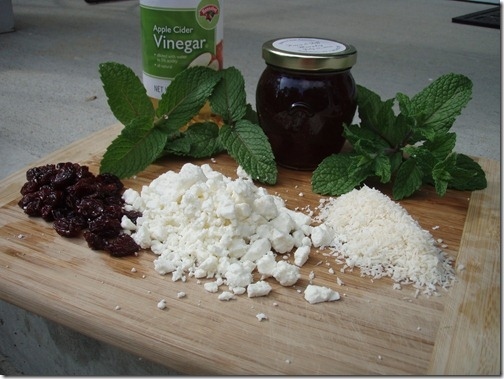 Wow, I would not have thought of putting feta cheese in this dish, but sounds pretty good. I am using a lot more coconut oil myself. I like the recipes on your blog.